Professor Mike Ferguson CBE, Regius Professor of Life Sciences and Academic Lead for Research Strategy in the School was awarded a Doctor of Science (DSc) in today’s winter graduation at the University of St. Andrews. 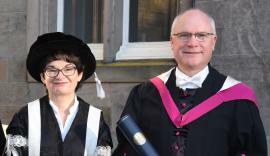 Professor Dame Sue Black OBE, Director of the Centre for Anatomy and Human Identification and the Leverhulme Research Centre for Forensic Science was honoured alongside Professor Ferguson. She was awarded an honorary Doctor of Medicine (MD).